After the Civil War, the vote was extended to members of all races by virtue of the 15th Amendment. In the former Confederate states, various laws were passed to inhibit the voting of former slaves. 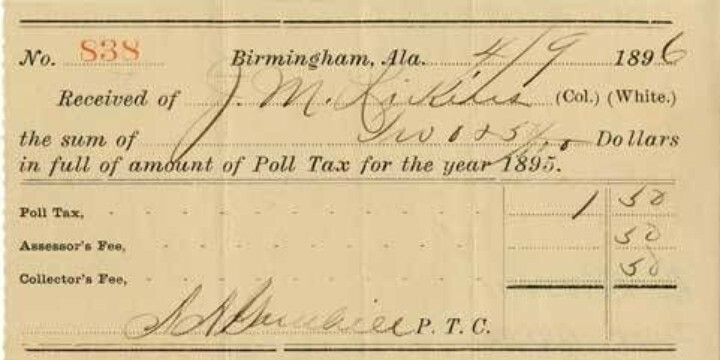 Among those laws were “poll taxes” requiring a payment to the government prior to voting. Through the history of the colonies and the early United States there existed various financial requirements for people to be eligible to vote. At one time only property-owning white males could cast ballots. As part of the federalism design, dividing sovereignty between the states and central government, the Constitution had originally left voting qualifications up to the states. The federal government had not been granted authority to determine voting eligibility. Since the central government had not originally been given power to determine voter qualifications, federal action regarding voting laws required constitutional amendments. This took place with the 15th Amendment, 19th Amendment, 23rd Amendment and the 26th Amendment. Following the Civil War, many efforts were made by the former Confederate states to keep freed slaves from voting. Laws designed to discriminate included the “white primary” and literacy tests. Congress had the power to address these state laws based upon the Equal Protection clause of the 14th and 15th Amendment ban on racial discrimination. 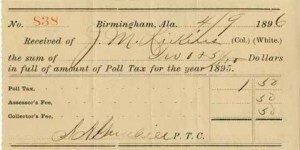 Poll taxes were a bit different in respect to the 14th and 15th Amendments. A poll or head tax is one enforced equally on all adults at the time of voting. Such a tax was imposed on all voters, and it did not discriminate overtly by race. As it was imposed on all voters and it could not be proven to discriminate by race, congressional power did not extend to poll taxes. As a result, while movements to expand voting rights had removed most financial qualifications for voting, in 1962 poll taxes remained in use in Virginia, Alabama, Texas, Arkansas, and Mississippi. If poll taxes were to be abolished nationally, it would require a constitutional amendment. This resolution became the Twenty-Fourth Amendment to the Constitution when on Jan. 23, 1964 it was ratified by South Dakota. The Twenty-Fourth Amendment by its terms applied only to elections for the federal offices of President, Vice-President, Senator or US Congressman. It did not ban the imposition of a poll tax for voting in state elections. However, in 1966 in the case of Harper v. Virginia Board of Elections, the United States Supreme Court held that a poll tax imposed in state elections was a violation of the Equal Protection Clause of the Fourteenth Amendment, effectively ending poll taxes in all elections in the United States. The Constitution’s Article I Section 2, in defining who can vote in federal elections provides: “Electors in each State shall have the Qualifications requisite for Electors of the most numerous Branch of the State Legislature.” Since the states set the qualifications for voters in elections for the state legislatures, they also set the qualifications for the voters in federal elections. Once given authority over a particular area of voting by constitutional amendment, the Congress then had power to address that area by law without further amendment. Prohibiting denial of voting rights on the basis of race. Prohibiting denial of voting rights on the basis of gender. Providing for the citizens of the District of Columbia the right to cast ballots in presidential elections. Prohibiting denial of voting rights to citizens over 18 years of age. “White primaries” were cloaked in a “freedom of association” argument. The candidates of political parties would be nominated in primary elections, and members of the party argued they had a right to approve who could be a member of the party. Democrats would systematically exclude blacks from membership in the party, effectively excluding them from voting in the primaries. In areas dominated by the Democrat party, this had the effect of denying blacks a meaningful vote. Slave owners had historically prevented their slaves from the education necessary to read and write. Imposing literacy tests for voting effectively denied the vote to almost all former slaves. As noted by the dissent of Justice Black, financial requirements for voting had always been a part of the nation’s history. Nevertheless, the Supreme Court found poll taxes in state elections to be an Equal Protection violation.